Approximate date from Brown, P. London publishers and printers c.1800-1870. 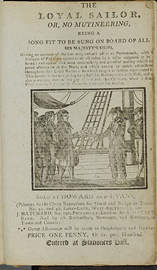 Caption title: The loyal sailor, &c. &c.
Woodcut: title-page vignette, signed by Lee (i.e., John Lee). Publisher's advertisements on p. .
First sentence: "Ye Britons brave. Who ride the wave, and make the cannon rattle, when winds do roar, who quit the shore, to fight your country's battle!" Copy in McGill Library Rare Books and Special Collections: bound with: The two wealthy farmers, or, The history of Mr. Bragwell : in seven parts. London : Sold by Howard and Evans ..., [between 1801 and 1811]. Bound together subsequent to publication with 47 other chapbooks, with binder's title: Repository of Moral & Religious Tracts. Bound in brown sheep over boards. text.chapbook.black and white, 18 x 12 cm.